Barcelona have departed for London in style ahead of their Champions League Group B clash with Tottenham. 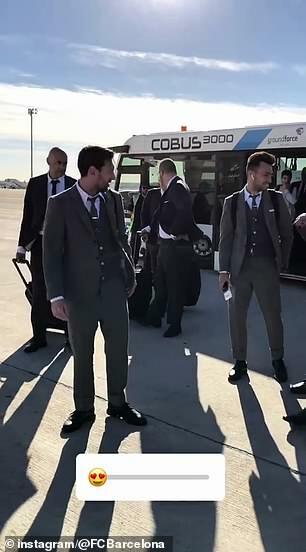 Lionel Messi and Co were pictured boarding the flight to the English capital on Tuesday morning wearing sophisticated grey suits. The Barcelona stars, who were all matching, debuted the newly-designed outfit by Thom Browne tailors – the club’s global sponsor. They were dressed in the classic two-fold Fresco dress with a medium-sized grey of Thom Browne, along with a white shirt with an Oxford tie, a 4-bar jacket vest and black shoes of grain leather of pebbles – all of which comes to a grand total of £4,200. Even manager Ernesto Valverde was donning the stylish all-grey outfit complete with white shirt and black shoes. With 20 players in Barcelona’s travelling party, plus the manager wearing it, it’s around £100,000’s worth of just travel gear. American fashion brand Thom Browne were announced as the club’s official provider of the team’s off-field tailored and formal wear uniforms earlier in the summer. The Barca players will wear Thom Browne suits for the next three seasons for their trips to away Champions League matches and Tuesday marked the first occasion since the deal was agreed. Messi and Co are expected to land in London on Tuesday afternoon ahead of their match in Group B with Tottenham. Ousmane Dembele has travelled with the squad but looks set to start on the bench with Valverde reportedly considering setting up in a 4-4-2 formation, having failed to register a win in their last three matches. Tottenham on the other hand have won their last two league games and will want to pick up the three points, having lost their opening match against Inter Milan last month.